Actor, activist, and current Broadway star George Takei posted a video message Wednesday night on Facebook directed toward Republican presidential candidate Donald Trump, criticizing Trump for his recent remarks on Japanese-American internment camps. "You've been out campaigning for president and you've said some things that have many people worried," Takei, dressed in a costume from his Broadway show "Allegiance," said in the video. Takei referenced Trump's recent interview with TIME, where the Republican frontrunner was quoted as saying he did not know if he would support or oppose internment had he been a leader during World War II. The political discourse today is why the story @GeorgeTakei @MsLeaSalonga @tellyleung are telling on Bwy is so relevant! @allegiancebway GO! Takei responded directly to Trump's statement, saying, "You said it was a 'tough' thing and that you would've had to be there. Well, Mr. Trump, I was there." 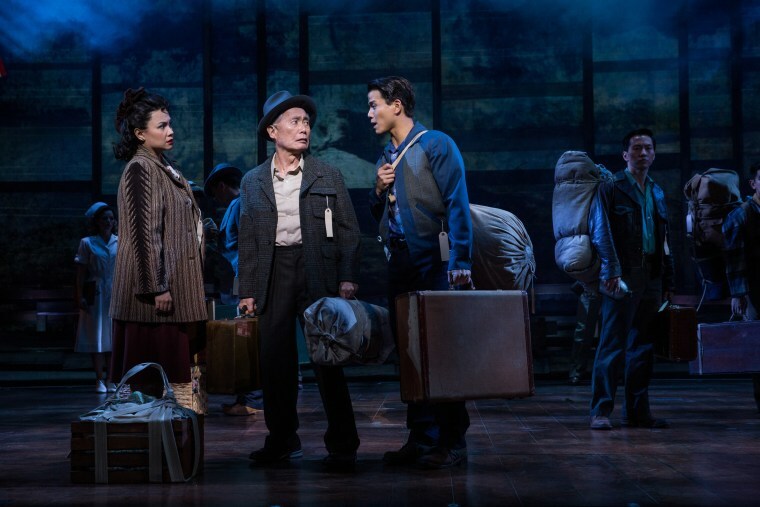 Takei went on to invite Trump to see his show, "Allegiance," which is loosely based on Takei and his family's own experience during WWII that led to their relocation to an internment camp in Arkansas. Takei was one of more than 110,000 Japanese Americans who were forced to leave their homes after the Dec. 7, 1941, attack on Pearl Harbor, and relocate to camps across the West. "If you want to see how tough it was from the comfort of your seat, you can be there with us in the camps and get a glimpse of what it was like for families like mine who were unjustly imprisoned thanks to a politics of fear—much like the one you're campaigning on," Takei said. A recent proposal by Trump to ban all Muslims from coming to the United States has been met with bipartisan opposition, including by members of Trump's own party. "So, Mr. Trump, I'm throwing it down: come see 'Allegiance.' Unless, you're chicken," Takei said, ending his video with a wink.